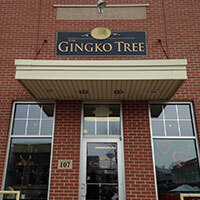 The Gingko Tree carries a unique and special collection of items that are sure to please anyone. All of the products we carry are carefully hand selected, and our helpful and friendly staff are here to help you find exactly what you are looking for. The Gingko Tree carries a warm and relaxed ambiance that cannot be found just anywhere. Whether you are hoping to find a heartfelt greeting card, book, game, jigsaw puzzle, baby gift, decorative items for your home, or a beautiful season accent — we hope you will stop to see us.